La Casa offers basic assistance items for our families and community members in need. This includes food, clothing and household items. Donations are received year round from individuals, groups and businesses. Referrals for assistance come primarily through word of mouth in the community and law enforcement or other agency referrals. Our food pantry is stocked by donations from local churches, charitable organizations and individual donations. We provide canned goods and non-perishable grocery items, as well as, household items to families and individuals in need. 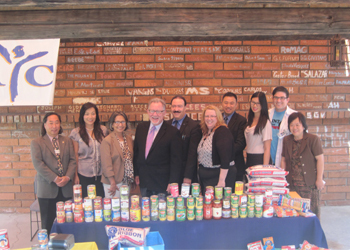 Last year we worked in conjunction with the Asian Youth Center on our first annual food drive. La Casa receives both new and modestly used clothing, shoes, and accessories. These items are available to our families and community members in need and have been very helpful especially during these recent trying economic times. We do occasionally hold rummage sales to raise funds and clear through seasonal items but the majority of clothing goes directly to our families. In an effort to further assist our families, La Casa helps with the distribution of new and modestly used items such as car seats, strollers, small appliances, books and toys. These items are often taken for granted by many of us but make a big difference to our families that struggle to make ends meet. La Casa has expert staff on hand to assist our families and community members locate needed resources. Our trained staff not only acts as a referral agency but can provide preliminary assessment, assist with enrollment documents and advocate for our families with other agencies.